In the 18th century, it was popular for well-off young men to take a Grand Tour of Europe after finishing school and before settling down with the responsibilities of adulthood. For Henry "Monty" Montague, this means traveling with his best friend Percy and his sister Felicity. Monty is a complete rake and has just been kicked out of school; the tour is his last opportunity to prove to his father that he's not a complete screw-up. Felicity, who has always wanted an education, is to be dropped at a finishing school along the way. And they are to be accompanied by a stuffy chaperone, whose job apparently is to make sure they don't have any fun at all. But it goes off the rails rather early and the group ends up being attacked by highwaymen, captured by pirates, and having an amazing adventure, during which they all grow up quite a bit and come to learn their own value. Did I mention that Henry is in love with Percy? Or that Felicity is more suited to medical school than finishing school? Or that Percy is biracial? There is a lot going on in this novel, and it is all completely my sort of catnip. 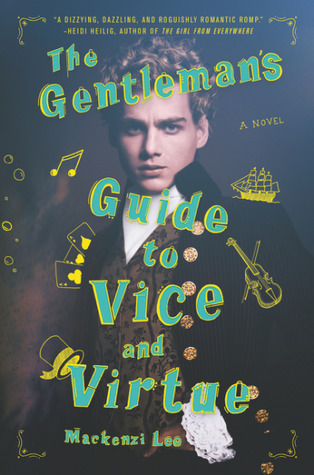 The Gentleman's Guide came out in June, but I heard about it last winter when a librarian I used to work with raved about it after reading an advanced copy. I was sold on the cover alone. It seems a bit long (500 pages) but it's super easy to read! I sped through it in just a few days. The author uses a lot of period terminology I was unfamiliar with and had fun looking things up (xebecs, cicerone) even though in most cases I could get the general gist from the context. Monty is the narrator and his voice is just so casual and flip, but fun and witty. He describes his own dimples as "so deep you could pour tea into them." Yes, he is egotistical and self-centered. Although Percy is his best friend, it has never occurred to him that Percy is often treated differently because of his brown skin, often mistaken for a servant or a slave. Monty is also such an incredible flirt. He's the Jack Harkness of the early 18th century. He's attracted to everyone, it seems, male and female alike. In one scene Percy says "You would play the coquette with a well-upholstered sofa." The two young men banter so much that they can't decide if the other one is reciprocating romantic feelings or not, and if those feelings are serious or just more about having fun for the moment. I've barely mentioned the plot and adventure! Near the beginning of the tour, Monty is already partying a little too heartily. He ends up in a compromising position with the mistress of the Duke of Bourbon (whom he has already offended) and manages to steal a valuable object during the escapade. He just swiped the small puzzle box to piss off the Duke, thinking it was nothing but a trinket, but of course it turns out to be more valuable than he ever could have imagined. This theft sets the whole rest of the adventure in motion, as the group is now being pursued by those trying to help the Duke get it back, but when it's discovered that the Duke stole it himself, Monty thinks they should return it to the rightful owners. The adventure takes them all over Europe in a very different sort of Tour than they had planned. I could go on at length and quote more passages that I like and talked about how much I like the characters (and can we have another book in which Felicity is the star? *) but just go ahead and read it for yourself!